Whether it’s a Mag-Safe cable, the original 30-pin connector or Lightning connector for iPhone or the latest USB-C for the latest MacBook, they all seem to have one thing in common. They are not very durable. If you need to replace an existing USB-C cable or just want to add an extra cable to your collection, check out the Aukey Nylon Braided USB-C Cable. Like most of the Aukey products we have tested, the Aukey Braided Nylon USB-C Cable is light on packaging. 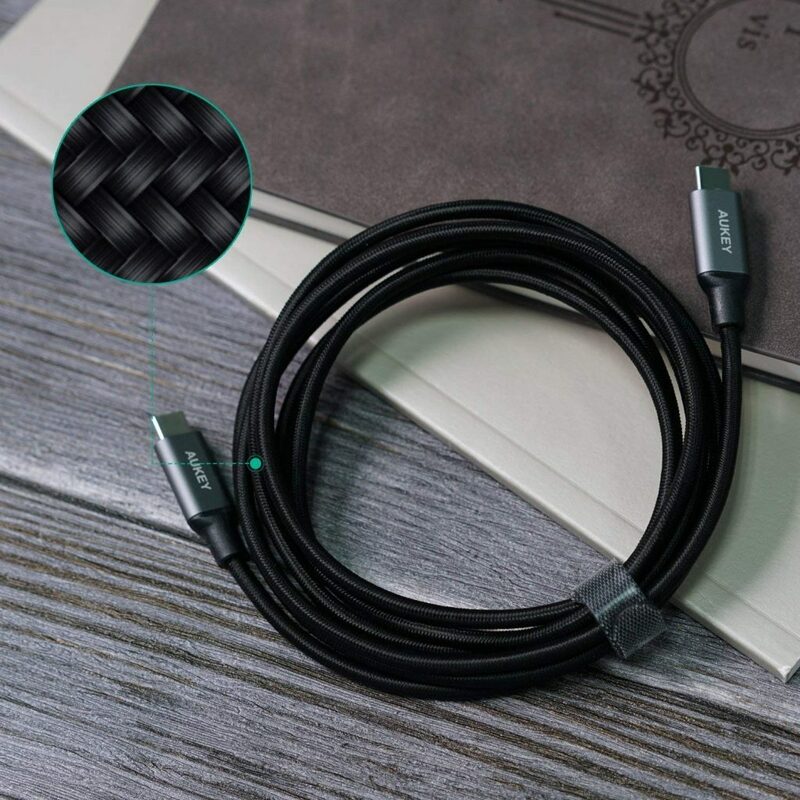 In the box is the Aukey Braided Nylon USB-C Cable (Model # CB-CD6), a User Manual and a standard Aukey 45-day money back guarantee and 24-month warranty card. The cable measures 6.6 feet long (2 meters), and out of the box is coiled to a compact size and secured with its own cable tie. 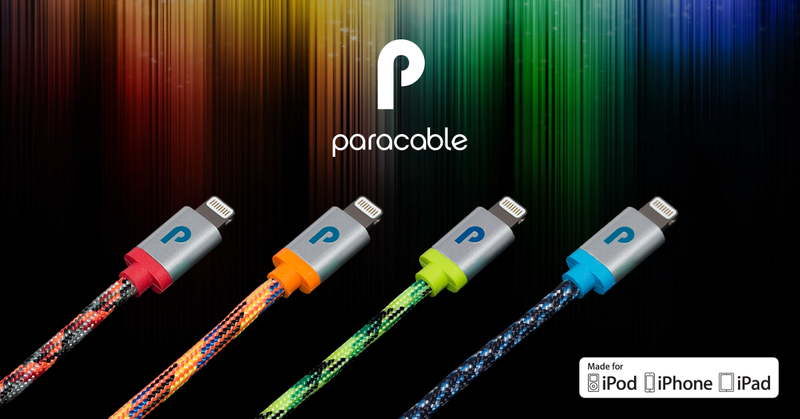 This is the perfect cable to throw in your backpack or purse. The Aukey Braided Nylon USB-C Cable is more than just a pretty face. 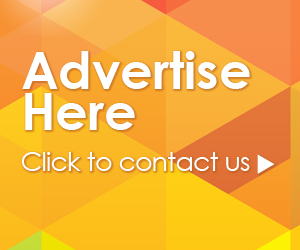 It is built tough to handle all of your power and data transfer needs. The exterior of the cable is wrapped in a strong braided nylon, tested to over 6,000 bends. The nylon outer shell protects the aluminum shielded core. The cable is thick enough to avoid kinks and knots when packed away but because of the outer nylon wrapping, is still light weight and easy to manage. Attached on each end is a standard USB-C connector. The fully reversible connector has a steel shielded cover to reduce interference and reinforce the cable. The connector is housed in an aluminum alloy with a rubber strain relief protecting the nylon outer shell of the cable. The cable ends are slim enough to allow use of both USB-C ports on our 2017 13” MacBook Pro. The cable is listed as a USB 2.0 cable and is rated for 480Mbps data transfer and supports charging up to 3A. Because there are so many variables in measuring data transfer speeds, we didn’t test for actual numbers but can say that we were generally satisfied with the performance of the cable. We especially like the 6.6-foot length. When traveling or even in the local coffee shop, it’s often hard to find an electrical outlet close enough to where you want to be. We have always felt that the cables supplied by Apple were too short and while they offer longer versions, they also charge a lot for them. As USB-C becomes more popular, people are bound to need more cables to meet their needs. While the Apple OEM cables are high quality, they come at a steep price. 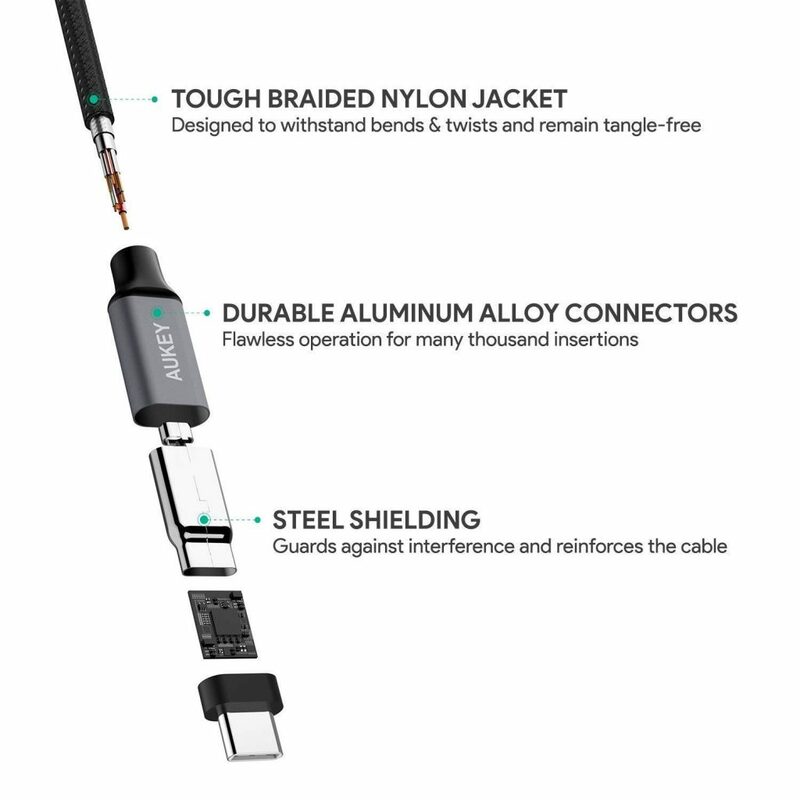 Third part cables, like the Aukey Braided Nylon USB-C Cable, not only come at a significant savings, but provide added durability and features that make them a clear choice. The Aukey Braided Nylon USB-C Cable is available from Amazon. You can also check out the full line of Aukey cables on their web site at aukey.com. We would like to thank the folks at Aukey for providing the Aukey Braided Nylon USB-C Cable for our testing and review.